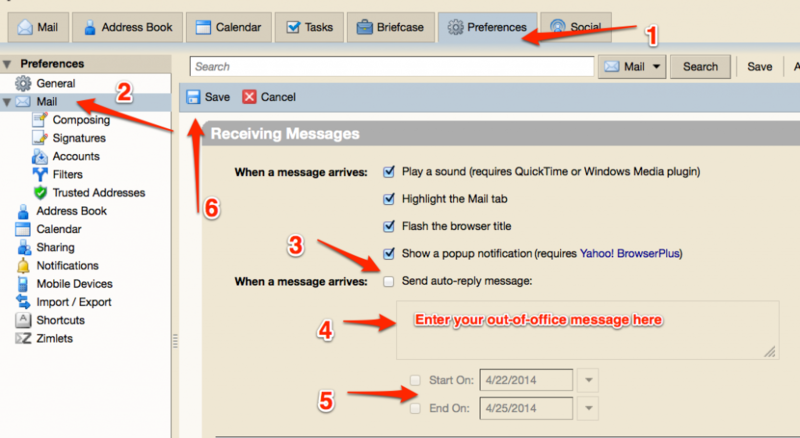 Zimbra can be access via the built-in Mail, Contacts and Calendar apps on iPads and iPhones. Please visit the Mobile Devices and Zimbra page for information and instructions. Question: I can’t figure out why I’m unable to create an e-mail signature in Zimbra. I went to Preferences–Mail–Signatures, and then typed in my signature (name, title, etc.) and hit the save button. I’ve tried sending test e-mails to myself, but the signature does not show up. Answer: Go to Preferences and then Accounts. At the bottom of the page change Signature from “Do not Attach Signature” to whatever you named your signature. Question: Exactly when are messages marked as read when viewed in the Reading Pane? Question: Printed emails are seriously tiny. Is there a way to make the fonts bigger? Answer: Be sure you are using the Zimbra printer icon and NOT the print function in your browser. When you click the Zimbra “print” button the message opens in another window. In the upper right corner of that window you can make the print larger or smaller. I like to enlarge it several sizes to make it easier to read. Question: From reading the descriptions of zimbra on the net, it seems that the messages I delete will eventually disappear so I don’t have to go through the steps that I did in eudora and sunjava, where deleted messages had to be deleted a second time. Is this correct? Answer: Yes this is correct – messages are kept in Trash for 30 days and automatically deleted on the 31 day. However you can manually Empty Trash if you want. Question: I am only seeing some of my messages. Where are the rest of them? Answer: There are two modes for viewing messages – Click View button (top right) to see By Conversation or By Message. A blue dot will appear next to the selected mode. By Conversation means that it groups all related messages together under one message so you don’t see all the individual messages unless you click the small arrow next to the combined message. This is covered in the Intermediate Email Video. If you want to see all messages you should set View to be By Message. Question: When I am on a webpage and click on an email address, Zimbra is not the email system that shows up. What is happening here? Answer: A webpage email link activates the default email system located on the computer you are using. Because Zimbra is a web-based system, without any software stored on your computer, it cannot be selected as the default email system. The answer is to copy the email address, go into Zimbra, select to create a new message and paste the email address into the To field. Question: Which email clients are supported by the District? Question: I created a mail folder which I inadvertantly made as a subfolder to my Inbox; I don’t want it there; how can I move it out to be a primary folder of its own? I’ve tried dragndrop, and deleting to no avail. Answer: You should be able to drag/drop the folder. Until Zimbra provides this feature a work around is to create the new folder where you want it, drag the messages from the wrong folder to the correct one, and then right click (or control click on a mac) and delete the old folder. As a side note, you cannot have two folders with the same name, so you might rename the wrong folder first. Question: I’m going to be out of the office for a while. How can I turn on an automatic away message? In Zimbra, click on Preferences. Enter your message in this box. Question: There used to be checkboxes to the left of each message in my mailboxes so I could easily select multiple to move, delete, etc. Answer: An update to Zimbra caused these to disappear, but they can be re-enabled. Click General in the left sidebar. Under the Other heading, check the box next to Selection. Question: The selected message in Zimbra used to show up directly beneath the list of messages. Now it’s on the right instead. How can I change it back? Answer: Click the View button in the toolbar, then select Reading Pane At The Bottom. Question: I logged into Zimbra and found parts of the interface are missing. For example my mailboxes aren’t showing up in the left sidebar. Answer: This can be caused by problems with your browser cache. Clearing your cache/history should correct the problem.